Fly to new heights on Soarin’™, an exhila¬rating ride experience that picks you up and really gets you flying! You’ll feel as if you’re gliding over spectacular natural wonders and glorious countrysides, taking in the sights, the sounds, and scents – like a bird in flight! What’s it like to be an astronaut? Find out aboard Mission: SPACE® as you dodge meteors, navigate nebulae and slingshot around the moon…without leaving Earth. If you think you’ve got the right stuff, join the Orange Team for some seriously intense training that lets you feel the full force of an actual space launch. Or, if you’d prefer a not-so-white-knuckle-filled journey, join the Green Team. Both adventures are out of this world. 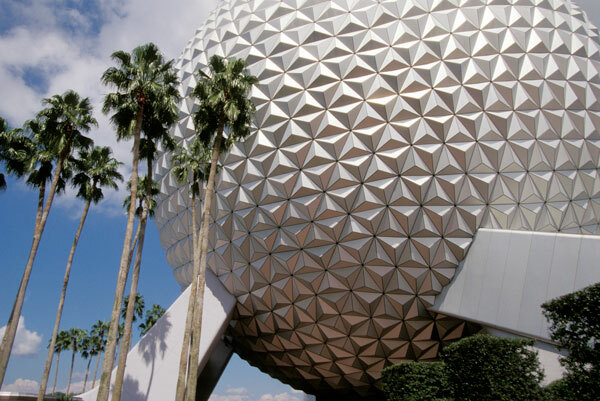 Come have a ball inside the incredible icon of Epcot®––Spaceship Earth! With a world of amazing, new enhancements, including narration by famed actress, Dame Judi Dench, this classic attraction will take you from living in the past to picturing yourself in the future…literally. And the excitement doesn’t stop when your Time Machine does, because that’s when you get to experience “Project Tomorrow”––a brand-new interactive playground area where you can build, play, create, compete and explore. Leave it to the wacky scientists of the Imagination Institute to put your senses to the test with the help of a playful purple dragon! Aboard Journey Into Imagination With Figment, you’ll wanna listen up in the Sound Lab, use your Common Scents in the Smell Lab (watch out for the skunk junk) and watch your world turn upside down in Figment’s house. There’s no journey like the one into your imagination! Creativity and imagination abound as you celebrate innovations that enhance your life and expand your horizons. But, that’s only half the fun. In World Showcase, you can travel around the world…and you don’t even need a passport! Eleven great nations offer the best of their food, music, products and culture. Journey through the poetic mountains of China; soar in a balloon over France; encounter tricky trolls on a Viking expedition in Norway; sail down a River of Time in Mexico. And the food! Gourmet French cuisine…succulent steaks from the Great White North… bratwurst and beer from Germany… Mediterranean sandwiches from Morocco…the finest seafood, sushi and vegetables from Japan…fresh-baked Norwegian pastries and desserts… it’s an international feast of delectable delights. Plus, you can shop ‘til you drop, indulging in tempting Guerlain fragrances, Goebel Hummel figurines, glass etchings, antiques, trinkets, jewelry, gifts, toys and more. You’ll find something to amaze and excite everywhere you turn…from living “statues” in France to rock ‘n’ roll bag-pipers in Canada. This family-friendly attraction will whisk you away on a boat for an unforgettable adventure through the wondrous wintery world of Frozen. Embark on a journey that takes you through the frozen willow forest, past Troll Valley and up to Queen Elsa’s ice palace high up on the North Mountain. Sing along with some of your favorite Frozen songs as you glide through Arendelle as part of a special “Summer Snow Day” celebration. Experience popular Disney and Pixar short films like never before—in 4D for the first time ever. Venture inside the Magic Eye Theater to view a special pre-show presentation, where John Lasseter, chief creative officer of Pixar and Walt Disney Animation Studios, gives you an inside look into the collaborative creative process of bringing beloved stories and characters to life. Then, enter the auditorium, don a pair of 3D glasses and settle in for the 18-minute festival, featuring 3 dazzling short films and in-theater effects. Get ready to soar over the Great Wall of China, Switzerland’s Matterhorn mountain, and spectacular scenic wonders on every continent in this brand-new adventure. Your imagination can take flight in this epic re-imagining of an Epcot® classic. Come join us for Soarin’ Around the World! Design your own custom concept vehicle, then buckle up and put your design through its paces on the exhilarating hills and switchbacks of the Test Track circuit. Enter Spaceship Earth the iconic geodesic dome and explore the history of communications, from the Stone Age to the computer age. Take a ride through time for a look at the landmark moments that made today’s communications technology possible. This ultimate interactive thrill-packed adventure is as close as you can get to blasting off into space without leaving Earth. Each member of your astronaut team has a challenging role in a dynamic and daring cosmic mission dodging meteors and navigating nebula. Feel the force of lift-off and have an exhilarating, mystical rendezvous on another planet. It’s out of this world! Yo, Dude, come check out this totally cool interactive show. Go under the sea and have a conversation with Crush in his digital underwater world. The 152-year-old sea turtle from the Disney presentation of Pixar’s “Finding Nemo” chats, jokes and even recognizes Guests. This is a first-of-its-kind live, real-time animated show you have to see to believe. It’s soooo awesome! Transform into a secret agent during this highly interactive quest based on the Disney Channel animated series Phineas and Ferb. Travel around World Showcase to help Agent-P the alter ego of Perry the Platypus—conquer a series of challenges! Experience the sights and sounds of Mexico on the Gran Fiesta Tour Starring The Three Caballeros. Take a delightful boat ride and follow the adventures of Donald Duck, José Carioca and Panchito from the Disney film “The Three Caballeros.” This fun-filled journey showcases the people, culture, history and arts of Mexico and is enjoyable for all ages. Thrill to an epic theatrical event with authentic historical characters, magnificent music and extraordinary effects on stage and screen. Meet the inspiring American heroes who reaffirm the county’s greatest resource: its people. There’s no adventure like The American Adventure! Marvel at the wonders of nature in this delightful film that combines animation, live action and your favorite “Lion King” characters. Timon wants to open a non-ecological resort, but Pumbaa and Simba realize how important the different kinds of plants and animals are to the health of the planet. After all, they’re part of the Circle of Life. Enter a charming, fairy-tale inspired village centered on a cobblestone plaza. Visit splendid shops like Der Bücherwurm, with its steins and hand-painted eggs; Der Teddybar, an amazing toy store; and Kunstarbeit in Kristall, featuring crystal jewelry. Enjoy extraordinary food and song-and-dance at the one-and-only Oktoberfest Musikanten at the Biergarten, or catch a quick bite of schnitzel at the Sommerfest. And don’t miss the daily wine tastings at the Weinkeller or the delicious caramel treats at Karamell Kuche! Immerse yourself in an interactive “playground of the future” starring Figment, where kids of all ages unleash their imaginations while playing with uniquely responsive hands-on exhibits. Soar throughout this magnificent country in this stunning five-screen panoramic film. Race cars in Cannes, ride boats on the Seine, fly over the cliffs at Normandy, ski over dangerously rocky peaks, sweep over the exquisite countryside in a huge hot air balloon, take a tantalizing train ride into Paris, climb the elegant Eiffel tower! Get ready to have a blast—of science! Creative, fun and fascinating, Innoventions lets you experience hands-on, high-tech exhibitions that are like a thrill ride for your mind! Our interactive installations make you the scientist as you explore and discover the how and why of everyday life. In Colortopia Presented by Glidden, you’ll experience the wonderful world of color! Explore 3 interactive zones—the Color Lab, Color Our World Studio and Power of Color Theater—for a fun, informative take on the many ways color affects our lives. From creating custom hues with a digital paint palette to understanding how different shades can impact moods, you’ll learn how every color tells a story. Enter this dazzling pavilion through architecture reminiscent of Venice, including a stunning version of the Campanile (bell tower) of St. Mark’s Square, bridges, gondolas and colorful barber poles. Discover fine leather goods at the handsome Il Bel Cristallo. Eat well with sweets from Delizie Italiane and La Bottega Italiana or sumptuous full course meals from Tutto Italia Ristorante or Via Napoli Ristorante e Pizzeria. Enter a serene place with rock gardens, an abundance of water in koi-filled pools and streams, a handsome pagoda and a stunning torii gate. But there’s plenty of action, too – with the astounding Taiko drummers, Matsuriza; the incredible candy artistry of Miyuki; and lively restaurants which include Teppan Edo, Tokyo Dining and the Yakitori House. Plus shops galore where you can find authentic Japanese apparel, toys, and Bonsai trees. Take a rollicking ride through the Imagination Institute, where that playful purple dragon Figment really puts you to the test! Climb aboard a train of thought in the Sound Lab. Use your Common Scents in the Smell Lab. Watch your world turn upside down in Figment’s house. There’s no journey like the Journey into Imagination! Set sail on a voyage of discovery through living laboratories. Cruise through a tropical rain forest, the African desert and the American plains to discover the latest developments in aquaculture and desert farming. Float by experimental greenhouses and take a fascinating first-hand look at an aqua environment. Step into a faraway land divided into two fascinating sections, the Ville Nouvelle (new city) and the Medina (old city). Discover a bustling plaza with shops featuring remarkable Rabat carpets, woven belts, leather sandals, fabulous fezzes, beautiful brass pots and planters, and much more. Enjoy the scrumptious delights and marvelous bellydancers at Restaurant Marrakesh, the incredible world music sounds of Mo’Rockin’ and the awesome artifacts at the Gallery of Arts and History. Discover the glory of a great land with the sweeping grandeur and spectacular sounds of this Circle-Vision 360° filmed presentation. You are in the center of the action, surrounded by the stunning variety of America’s neighbor to the north, from its wide open spaces abundant with wildlife to its sparkling cities and harbors teaming with activity to its magnificent mountains and shores. Explore China as never before in this stirring Circle-Vision 360° film that puts you in the center of the action. Sweep from Beijing to Shanghai, from inner Mongolia to the Forbidden City, from the distant lands of the Hunan province to the Great Wall, discovering all the brilliant facets of this Land of Many Faces. Travel thee to jolly old England, where you can stroll through an informal area with a 1500s-style thatched-roof cottage and canal or stop to catch the beat of the British Invasion at a formal square with a Hyde Park bandstand. Find a bounty of British toys at The Toy Soldier, unique clothing at the Sportsman Shoppe, and more authentic British goods at other delightful shops. Enjoy fish and chips at the renowned Rose & Crown Pub and Dining Room. And don’t miss the one-and-only Hat Lady who tickles the ivories at the Rose and Crown or the comical World Showcase Players. Behold the past, present and future of Earth at this stunning fireworks show that celebrates the spirit of humanity. 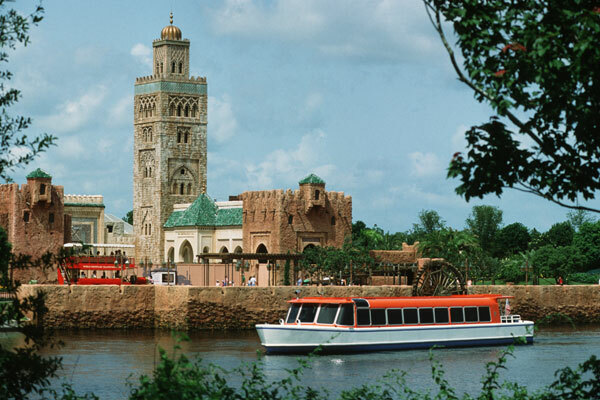 Gather around the World Showcase Lagoon to witness the incredible history of our planet. Earth’s fiery birth begins with flames and fireworks erupting from the lagoon. Beneath a swarm of heavenly explosions, red and golden lights blaze on the shimmering waters. As the volcanic effects subside, a glowing globe glides peacefully across the waters. Our individual stories culminate in one adventurous tale. The illuminated surface of the globe reveals the history of humanity and the achievements of our time. Comets of light race into the sky, before the globe blossoms like a lotus flower, revealing a torch ablaze with our dreams. A chorus of voices rises as the entire lagoon dances with bursts of joyous white light. Guests visiting Disney’s Epcot have the power to reserve access to some must-do experiences with Disney FastPass+ service including select attractions, shows, Disney Character Experiences and more. Disney FastPass+ service at Walt Disney World® Resort is included at no extra charge with Theme Park admission.